Traffic plays a vital role in surveillance. It concerns itself with the flow of participants, where they are coming from, and how long they will be there. How many people are being watched at a given time and how long will they be watched? Is the area of surveillance a thoroughfare or a settlement; meaning are they only traveling through, or is the area a destination? My goal is discovering what affects the flow of traffic and how does it affect it. I’m looking for how certain objects can effectively label an environment, thereby influencing the kind of traffic that occurs. To begin, I’d like to share the route my group collected data within. We began together at the State House,more specifically, in front of the Gressette building. 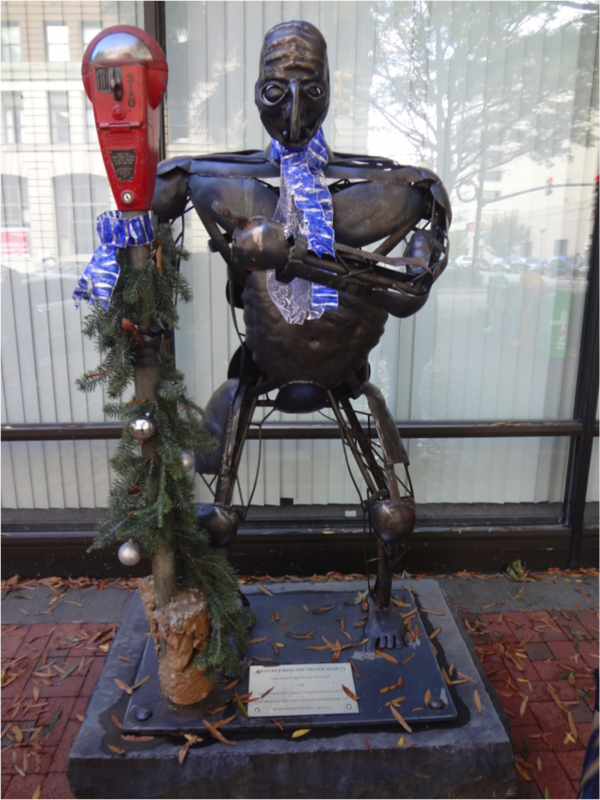 Located at: 1100 Gervais St, Columbia, SC 29201. We walked past the State House, down Main Street, through an arcade of art, back down Main Street, to arrive in front of the Gressette building once again. I think this is relevant to include so that our assertions can be questioned, built upon, and new data can be observed and collected if desired. I’ve labeled these areas based upon the traffic I’ve seen within them. I will introduce each area, and then more elaborately explain the objects I found and how they influence the flow of traffic through disciplinarity. First, I want to discuss the ‘call to action’ that I believe effectively labels one location we observed. 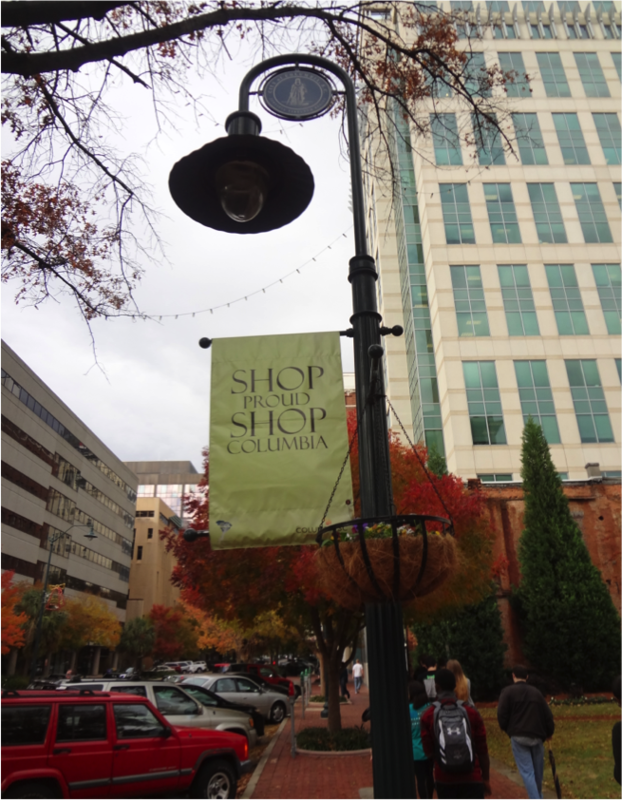 It’s one sign (of many duplicates) that reads “Shop Proud, Shop Columbia”. This sign alone renders Main Street a settlement. This is an area that is meant to have significant time spent within it. You cannot shop without staying within a store for a specific interval of time. In order to shop ‘proud’ one must have no restraints. Meaning they spend with ease, and in large quantity; thus also spending an amount of time as well. This sign reminds me of the Panopticon in that it’s asserting a desired behavior onto those who see it, while having no visible confirmation that those who see it can be seen fulfilling it. Upon the narrow window that we interacted with Gervais, it was evident that it was a thoroughfare. No one would seek Gervais as a destination unless they used it as a frame of reference for another destination; meaning they would use Gervais in order to reach Main Street, or the State House. It literally came right between Main Street and the State House. There would be no purpose to linger here other than being stuck in traffic (which isn’t a desired outcome). This is a means of smoothness for traffic; a way to access and arrive at the areas that you want to go to. When travelling upon Gervais, you don’t think, “Oh, I’m on Gervais!” you think, “Ah, I’m almost there!” Gervais is a tool to arrive at your intended stop, and that’s what distinguishes it as a thoroughfare. It’s not the outcome; it’s a way to the outcome. The State House has the possibility to be both a settlement and a thoroughfare. I personally witnessed this during my on site analysis. I found the majority of people traveling to other locations, as I saw them only briefly and traveling from one direction to the other. However, I also witnessed those who exercised, took photos of the State House and its grounds, and homeless making a bench their home. I find it necessary to credit this as both because it shows the versatility and efficiency that the State House has. It can function as the destination: an attraction for tourists outside of South Carolina, or locals who enjoy photography/exercise, or as an easily identifiable landmark that can make other lesser known areas easier to find. This marks the State House as the spot where traffic can vary the most, or at least traffic can be the hardest to predict here. Establishing what kind of area was which was determined primarily by observing the actual traffic (meaning seeing people moving and how they moved). I’m interested in what motivated people to move the way they do, and I believe I’ve found many objects, especially on Main Street, that help clarify what I’ve found. As I stated before, what distinguishes a settlement from a thoroughfare is the amount of time spent in the area. 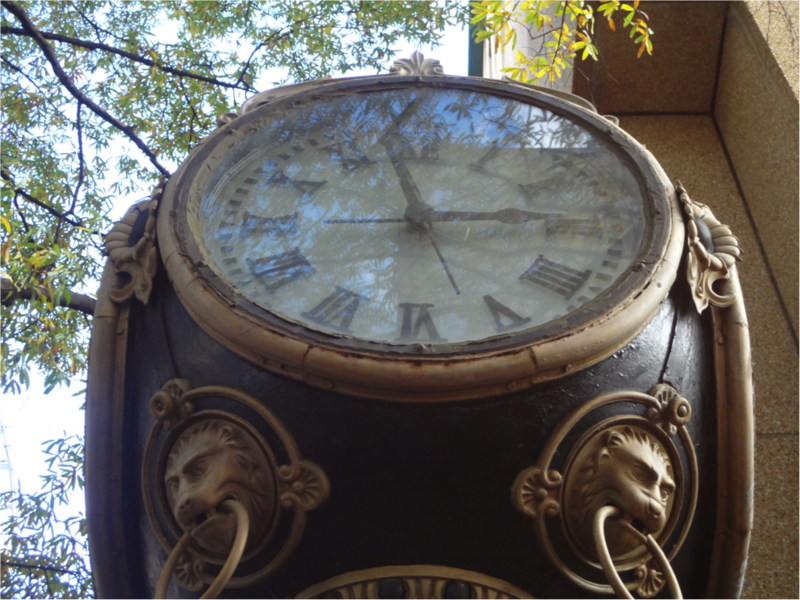 I found many objects that emphasized time especially within Main Street. Of course, you’ve got the old-fashioned clock with roman numerals to help remind you of the time, maybe to help you manage it. Some may write this off as expected, but I can’t think of many public places that have a clock as visible as this. I realize that we live in an age where our primary clock is the phone we carry in our pocket at all times, but this clock functions differently in its essence. It’s very disciplinary in that you look up to see it, and you may turn to your friend and say, “Oh my, what time is it? … Really? … Time’s really gotten away from us today!” I think it’s there for us in order to have these moments more frequently, and move on to either spend more money, or leave room for someone new to. This helps perpetuate the idea of “Shop Proud, Shop Columbia” along with its massive size and its decorative appeal. Parking meters and the clock indirectly affect the smoothness and efficiency regarding the flow of traffic on Main Street, but there are several objects that are more directly involved. The traffic signs all contain a very strong ‘follow the law’ feel to them. Especially the cyclist billboard, primarily because it mentions law and actually gives very direct instructions. The presence of this sign leads me to believe there have been issues with flow of traffic due to cyclists, and this is the local authority’s attempt to discipline them into following the laws in order to increase the smoothness of traffic. 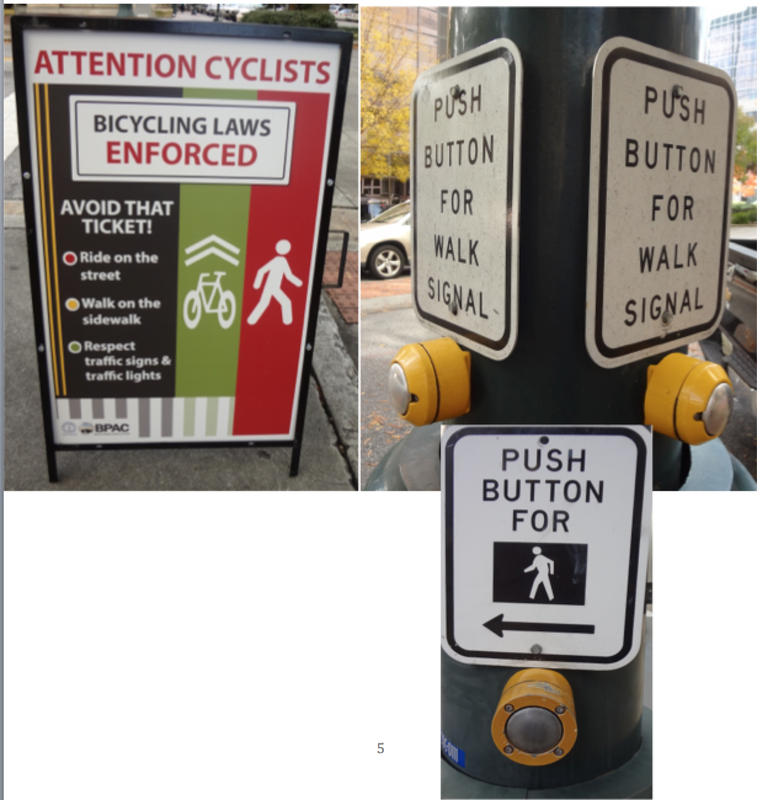 The walking signal signs and buttons though less direct than the bicyclist sign, also contain a similar, if not the same, disciplinarity. Containing all capital, all bold lettering, and (for the dull witted) symbols, to convey a simple yet direct message, “PUSH BUTTON FOR WALK SIGNAL”, thus implying you must follow the walk signal. This of course isn’t necessarily true, and the repercussions can go from extreme to lackluster. Dr. Heidi Cooley, during our group walk, actually walked after the walk signal had passed, only to have motorists wait patiently for her arrival to other side. This is most likely due to the location. The motorists, who expect large amounts of pedestrians, are less likely to react with anger because road signs and driving school have disciplined them. Pedestrians always have the right-of-way after all. These systems are in place to assist traffic with its efficiency and smoothness. How can pedestrians return to their car and get out of the way for new pedestrians if they’re stuck waiting at a traffic light? Not returning to their car as quickly can effect how quickly someone else can park. This effect quickly adds up when applied to multiple people, and it’s interesting that it all comes back to waiting on a sign to change to “WALK”. 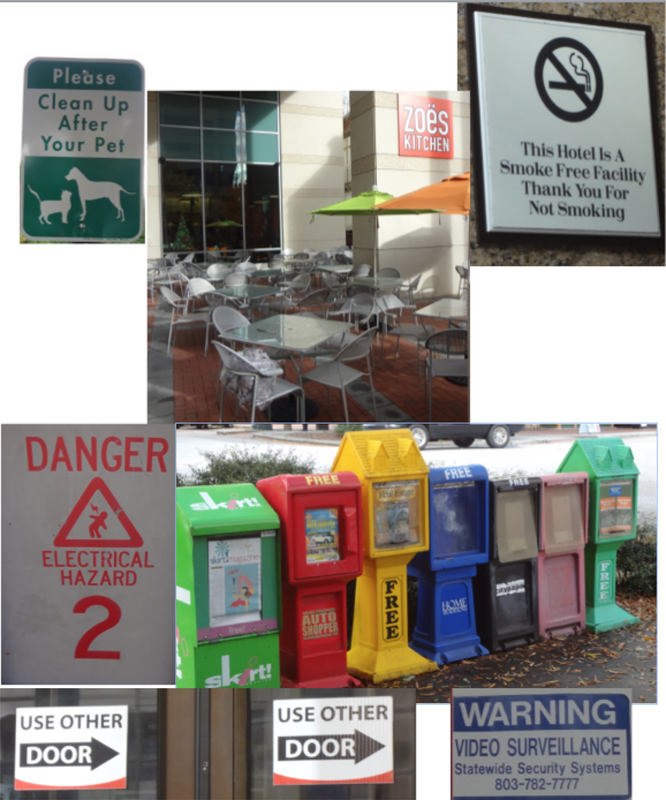 There are many other random assortments of objects I discovered that also affect the efficiency of Main Street. Most of which are very disciplinary in that they command or imply a command to the bystander. Once again, each of these objects is disciplinary, and they call us to respond in different ways. Some are very straightforward and say exactly what they mean upfront. Notice again; always bold lettering, and typically all capital letters, and even symbols if you don’t like reading. Some objects are subtler, but they get the message across. Specifically, the “DANGER: ELECTRICAL HAZARD” sign. It doesn’t say, “DON’T TOUCH”, but it allows one to speculate that coming into contact with it may not be such a great idea. The outcome would be pretty shocking (Ba-Dum-Tsh). Other objects require that you really think about what they’re doing in order to understand how they function as a product of discipline. The lines of colorful, FREE magazines/ads spark the interest in even the most skeptical human beings at times. We’re called to go and grab one if they’re free. Then, if we read this in the area we got it from, we then spend even more time in the area. Not to mention, if we see something we like in these ads, and they’re selling in the area, we go to that store and buy it. Feeding into this circular cycle and moving customers in and out. Most interesting, is the rows and rows of empty seats at a restaurant. This brings in the idea of capacity, or how much an area can hold. Typically, we search for areas that have less people, with the hope that we can be serviced. So upon seeing this, people feel motivated (disciplined) to go to this restaurant. With so many seats available, there’s a call for more customers. Upon seeing all these tables most assume that there’s a need for them; meaning that they become very busy, which means they’re in high demand. It is then possible that if an area receives high traffic (and a settlement does because people linger) that a restaurant of this ridiculous size at this time, can be packed and useful later. So in this instance I think the restaurant sets itself up for success because customers make assumptions based up the discipline that the tables put upon them. Many things influence traffic, but one of the most important factors are disciplinary objects. These kinds of objects help shape the behaviors of people in order to mold them to the liking of those in charge. When these objects work correctly, they create certain areas (typically settlements) into locations that are very efficient and have a smooth thoroughfare to go to and from them. Andrzejewski, Anna Vemer. "Efficiency." Building Power: Architecture and Surveillance in Victorian America. Knoxville: U of Tennessee, 2008. 43-90. Print. Burnitz, Carl. Mass Observation Study: State House Surveillance Report. Crary, Jonathan. "Chapter 2." 24/7: Late Capitalism and the Ends of Sleep (2013): 29-60. Print. Ewald, François. "Ewald Norms, Discipline and the Law." Scribd. University of California Press, Print. Foucault, Michel. "Eye of Power." Power/Knowledge. N.p. : n.p., n.d. 146-65. Print. Foucault, Michel. "Part 3 - Panopticsim." Panopticism. Harmondsworth: Penguin, 1979. 195- 228. Print. I'd like you to say something more about traffic and smoothness. Specifically, what would Crary say? I think you could apply the same concepts with 24/7 on the Internet and our cellular phones to the parking meters specifically. The parking meters are present and ingrained in city life, but they're not perceived typically or thought about as a major apparatus, though they are. This shows how smooth they are in processing traffic, much like the Internet and cellphones are smooth in processing communication or data. The meters affect the flow or amount of people in an area smoothly because people can't park legally on Main Street without a meter. Most interestingly they don't think about the meter, they think about obtaining a "spot". We don't think about a meter until we recieve a ticket, much like we don't think about a computer until it malfunctions. The meters affect the flow or amount of people in an area smoothly because people can't park legally on Main Street without a meter. Most interestingly they don't think about the meter, they think about obtaining a "spot". The way you used time and signs are disciplinary objects are interesting. I never thought of time as a disciplinary object until you stated it. 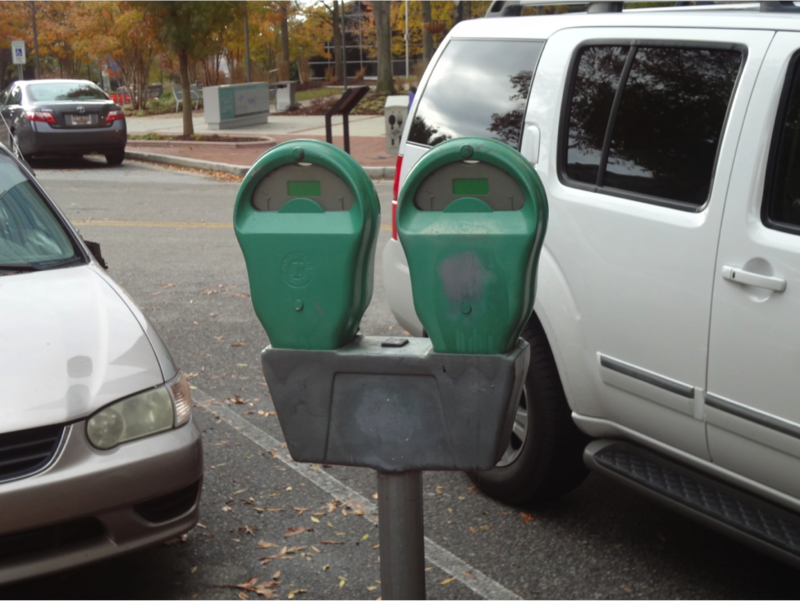 Although parking meters are used as discplinary objects, they don't always serve their purpose since people typically don't see parking tickets as a big deal. Your use of pictures and the map was also informative in the sense that you showed the direction in which we traveled, and how it was very uniform. The everyday signs people are accustomed to seeing was a good example of how certain things are ingrained in our behavior as well. We follow signs for the most part, because we don't want to break the rules. Thank you, I'm glad you found it interesting. I think you bring up and interesting question. What does it mean for a disciplinary object to 'serve its purpose'? You could argue that a parking meter didn't serve its purpose because people ignored the limits and got a ticket, or you could argue it did because of the possibility that a ticket could keep that individual from violating again. I wanted to use maps and pictures because I felt they were vital in order to complete understand what I was looking at. It's easier to understand what disciplinary objects are if you have lots of examples! Also, I agree with your final statement. I do believe that usually we don't want to break the rules. It feels uncomfortable to us. That psychological response would be another interesting topic to study. Firstly, your use of time as a motivating factor is very interesting and not what one would typically think of, however, when you talk about parking meters you use it in the sense that they are designed to smoothly regulate the people operating in an area; the meters time ends, those people leave, and new ones take their place. Is this really a good thing in a place like a shopping district? Would this not potentially make some patrons feel rushed, thus discouraging them from shopping? I guess one could say that it motivates people to move faster so more people can get in and go shopping, but I would feel that having a timer count down when I have to leave a place would discourage me from going at all, considering that this would be a place of leisure. I understand the connection you make of parking meters as disciplinary objects (the meters literally tell someone how long they can stay somewhere) but how do these objects effects someone's habits in relation to the part of town they're in? Also, I'd just like to point out that the map you've created is the perfect visual for what we did. 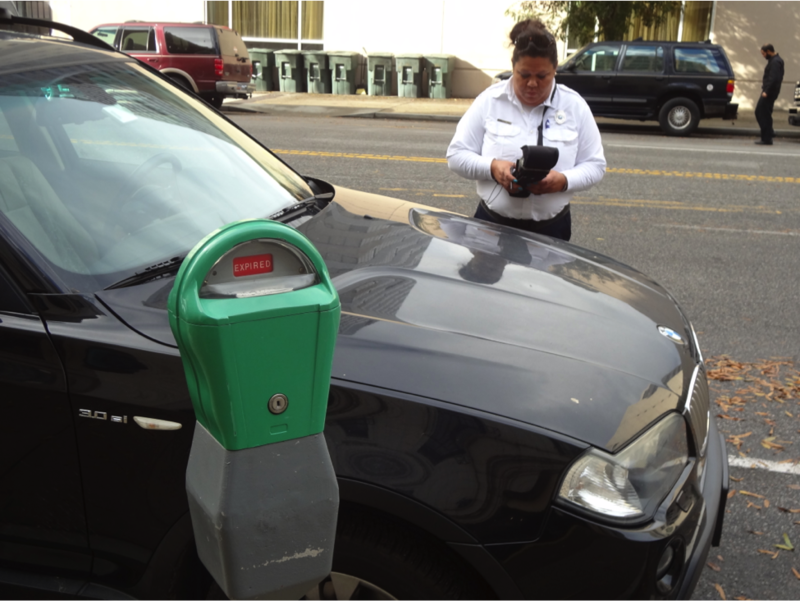 Overall, as I said before, I think parking meters motivate people to get in and get out. This can create a rushed feeling, but I don't think it causes most people to be discouraged from shopping. It's similar to Taylorism in my mind. People want to make the most efficient use of their time anyway, and knowing they only have a specific amount of time in an area, could motivate them to make decisions quicker. This is how it can affect our habits. We may usually 'take our time' to decide on the perfect gift, but in this scenario we're forced to compromise for the sake of time. However, you make a valid point, and sometimes we don't feel like rushing from place to place. I'm just saying that usually, even with parking meters, we don't feel the weight of time on us, which is another interesting thing I mentioned in how time 'gets away' from us. Thank you! I'm happy to hear my map was helpful. But, if time 'gets away from us' (meaning, the illusion of time going faster to the point where we lose track of it) would that not be somewhat harmful to the consumer? I don't mean to keep making the same argument as you've already provided a valid response to my previous post, but if we lose track of time while shopping, would the possibility of our parking meters running out of time increase? 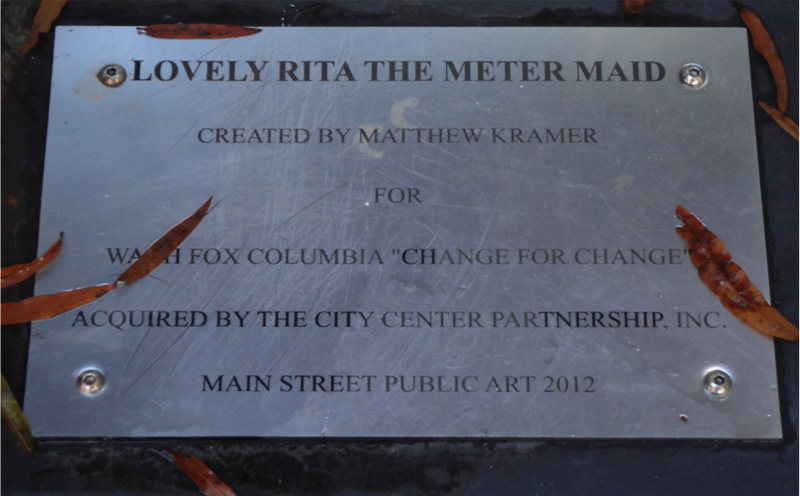 Is this section of the city cleverly designed this way to make us spend more on parking meters or even get tickets? Do you think the traffic flow can be improved by the state? If so How? I think the flow of traffic can always be improved. I don't believe there's a point where it is impossible to make it better. The state could add more thoroughfares (More roads, other areas for travel) and also add more places to park. These places to park most likely would be joined with parking meters, a parking permit, or be a part of a parking garage. This would be to make the available parking the most efficient by trying to motivate people to move, or at least make a profit if people are taking up space.